In 1856, a wayside inn was started by Galen Clark, one of the initial overseers of Yosemite Valley. In the fall of 1856 Yosemite Valley Inn (also known as the Lower Hotel), a primitive structure functioning more as a saloon than a proper inn was erected until it was crushed by snow. The following year, the 2-story Upper Hotel opened in the spring of 1859. While the early accommodations lacked in comfort, they more than made up with the surrounding beauty Yosemite had to offer. Located in the southern region of Yosemite National Park, Yosemite West in an unincorporated community of private residences and vacation rental homes. 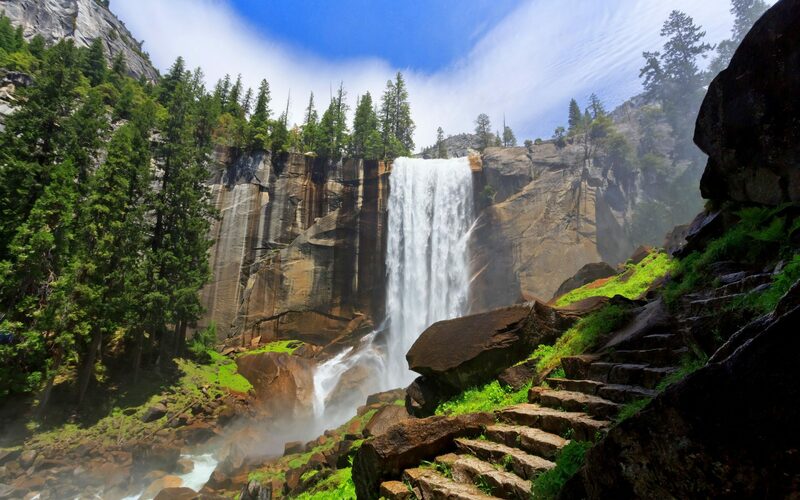 It is part of Mariposa County and is situated at an elevation of 5,866 feet, bordered by Yosemite National Park and the Sierras. Badger Pass Ski area is 6.5 miles away and the Tunnel View is 8.3 miles away, making Yosemite West an ideal area for visitors to start their Yosemite adventure. Long before the current residents, the North American Indian tribes made homes in the area as evident by grinding stones and obsidian chips used as arrowheads hidden in parts of the development. Located in the southern region of Yosemite National Park at an elevation of approximately 4,000 feet, Wawona is popular for giant Sequoia groves. The area consists of Pioneer Yosemite History Center, Wawona Hotel, Wawona Golf Course, Wawona store, library, gas station and offers horseback riding, hiking, nature walks. Indians used to call the area "Pallachun" or "Good Place to Stop." Approximately 6 hour drive from Los Angeles to Yosemite's southern entrance along Highway 41, 4 hour drive from San Francisco to Yosemite's Big Oak Flat entrance along Highway 120 or to Arch Rock entrance on Highway 140, and 3 hour drive from Reno, Nevada to the eastern entrance of Tioga Pass which is only accessible in the summer and early fall by way of Highway 120 from Lee Vining. Greyhound Bus and Amtrack will take you to Merced where one can take YARTS (Yosemite Area Regional Transportation). Ranging from rustic camp grounds to full service hotels, one can choose according to needs and price range. Typically accommodations are busy during holidays and summer season. Offer comfortable and affordable stay for visitors. According to number of guests and desired level of luxury, vacation homes provide fully equipped kitchens, hot tubs, barbecue sets, and other comforts of home. Yosemite's Scenic Wonders' homes and condominiums located in Yosemite West, inside the gates of Yosemite National Park provide such memorable stay and and offer the closest accommodation to Badger Pass Ski Area. They also have homes in Wawona and in the south gate community near Oakhurst. Restaurants in Yosemite Valley range from casual to formal. During the high season and weekends, they can be busy. Stores sell groceries and prices are higher. Vacation homes provide good alternative by allowing guests to prepare their own meals. Restaurants are available in the gateway towns of Mariposa, Groveland, Fish Camp and Oakhurst. Night walks, star gazing, seasonal lectures by rangers take place in the valley. Quiet hours are enforced in the valley. Oakhurst has movie theater, community theater and bars.